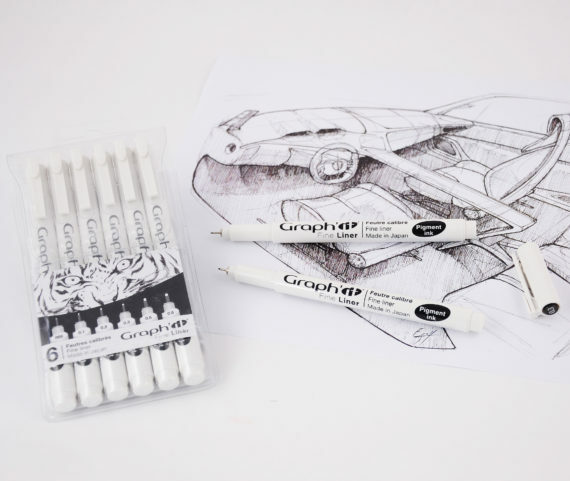 GRAPH'IT LINERS : THE IDEAL MARKER FOR PRECISION DRAWINGS ! GRAPH’IT offers a new range of water-based pigmented fine liners ! Available in 8 different nib sizes: from 003 caliber, the thinnest on the market, to 1.0 caliber, they are ideal for the outlines of a drawing and precise lines. These markers are also suitable for the use of tracing instruments or templates. These markers are made with acid-free ink that is resistant to UV light and erasing. They are fully compatible with alcohol markers, their pigmented ink does not fuse or smudge over or under alcohol ink. This perfectly dosed ink flow ensures a precise line. The intense black ink and the thin metal ringed tip guarantee the longevity of the thinness of the line : unlike other fine liners, the hard tip means that a 05 will stay a 05. The line will not become thicker because the tip is worm out. GRAPH’IT also offers a set of 4 Colour Fine Liners with matching colours caliber 0,5 : black, blue, green and red.